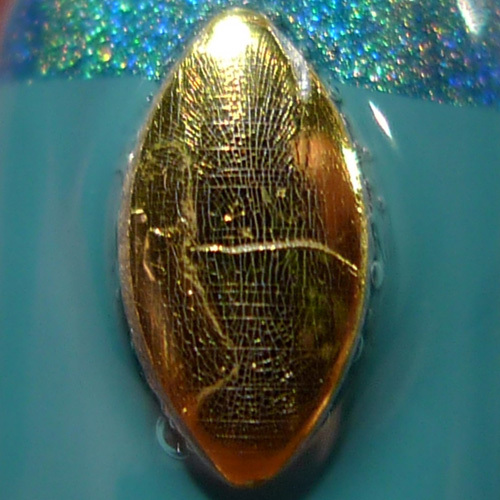 Love Varnish: a england Galahad and nail art! Hi loves! Last Wednesday I mentioned something about unedited pictures, well today I have the second set I didn't post before. It involves some fun nail art and with all the reviews lately I hope you'll enjoy this look! For this look I started with a base of a england Galahad. I still adore this teal beauty and the creamy formula that comes with it. 2 easy coats are all I needed! After it dried, I grabbed China Glaze DV8 and some scotch tape, and taped off the bottom part of my nails creating a straight "moon". China Glaze DV8 is very opaque so it was easy to layer over Galahad. Also, those 2 have the exact same shade of teal! They match perfectly.. must try some tone on tone stamping soon! After the "moons" dried, I grabbed my gold marquise shaped studs from Born Pretty Store (10% off using code DELJ61) and placed them over the lines I just created. Use a thick layer of topcoat to seal them in and all done. While I liked the combination of shades and the gold studs, I think a bigger color block with China Glaze DV8 would have been better. Now it wasn't even that visible in dim lighting because the shade is so close to a england Galahad! But oh well, you win some, you lose some right ;-)? What do you think of this look? And how would you use those studs? Tell me in the comments! Galahad is a beautiful turquoise. As for the studs, they look good in this mani but I'm not a big fan of them. That's such a sweet compliment! They aren't expensive so you could always order some to play around with :-).